Let us promote your business and events for you! An example of a listing is: www.glos.info/atc. It includes images, logo, address, phone number, weblink, map and Facebook & Twitter contacts and embedded feeds, so new clients can easily find you. We will run a competition on your behalf. All you need to do is offer a prize and you will get some free publicity! Our competition for Michael McIntyre tickets had 1,100 entries! You can advertise your event on www.glos.info FREE OF CHARGE. 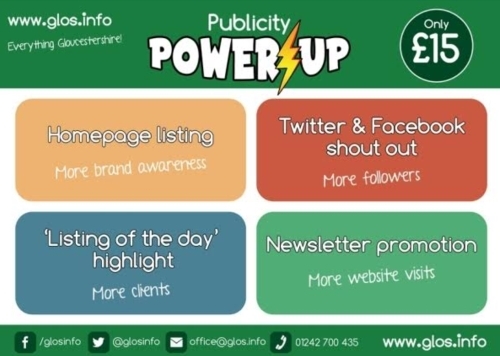 Simply email us the details to office@glos.info, so we can upload a listing and start promoting your event. So, drop us an email or give us a ring and we will get working on your behalf straight away!